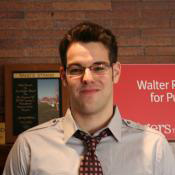 Alex received his undergraduate degree in Political Science and his Master in Public Administration from Rutgers–Camden. Alex’s work experience consisted of past internships at the state and federal level. At WRI he worked on an economic indicators analysis for Camden City. Page last updated by Senator Walter Rand Institute for Public Affairs at 12:42 pm August 2, 2016 . This page was printed from http://rand.camden.rutgers.edu/2014/02/18/kremstein-alex/ at 4:05 PM Monday, April 22, 2019.